As you know, last year we set ourselves the challenge of doing 50 good deeds. The first one to kick start 2018 was collecting Christmas trees to be recycled for St Gemma’s Hospice – a key fundraiser in the charity’s calendar. Well, despite the fact our 50 good deeds are completed (we had some lovely press coverage on it this week in Wetherby, Harrogate and Ripon), and the new year has begun, it’s one tradition we were keen to keep up to! So, this year, on 8th January, one of our removals vans took to the streets of Leeds to do a reverse Santa Claus again – it’s our job to take Christmas away! St Gemma’s wonderful scheme, which is in its sixth year, sees people sign up in advance for the charity to take their tree. 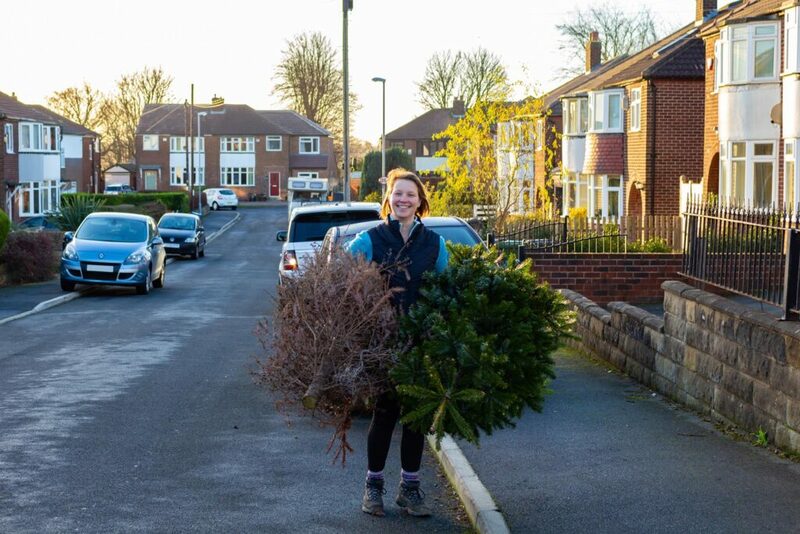 This year they collected 1,400 trees which were then recycled at sites across Leeds with support from Leeds City Council. We love the fact they’re taken and recycled – ties in nicely with our own recycling policy for all the shredded paper we hold. Apparently Christmas trees are also shredded and then the chippings are often used for pathways in parks or woods, or parts of the tree can be processed and used as soil conditioner or weed suppressant. Given there’s between six and eight million Christmas trees bought every year, environmental organisation WRAP estimates 160,000 tonnes of them are sent to landfill each year, which seems like such a waste! Ten vans and 80 volunteers came together to make for an entire week of collections across postcodes in LS6, LS7, LS8, LS13, LS14, LS15, LS16, LS17, LS18, LS19 and LS28. The collection raised a staggering £20,000 for St Gemma’s and the wonderful work it does – 10% up on last year, which is always good! Leeds-based St Gemma’s is one of the biggest hospices in the UK and it is the biggest in Yorkshire. It provides expert care and support for local people with terminal illnesses and offers invaluable help and kindness at the worst possible time in people’s lives. The majority of its income has to be fundraised, so thank you to everyone who took part in the tree collection – from paying for the service, to giving up time as a volunteer. Thanks Wayne for being our man in the van again this year – it’s one of the highlights of his calendar! If you’re interested in other events St Gemma’s is running, or would like to keep an eye open for the Christmas Tree Collection next year, go to its website to find out more. The Bubble Rush sounds like fun!